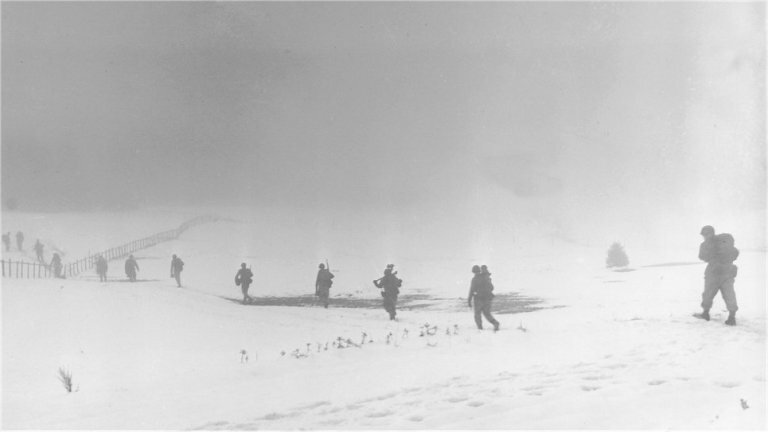 on December 20, 1944, during the Battle of the Bulge. U.S. Marines of the 28th Regiment, 5th Division, raise the American flag atop Mount Suribachi, Iwo Jima, on February 23, 1945. Strategically located only 660 miles from Tokyo, the Pacific island was essential to launching land-based bombers against Japan. 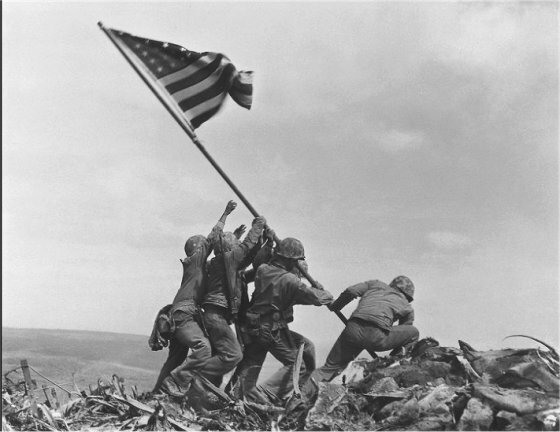 It was the bloodiest battle in the history of the U.S. Marine Corps, which suffered more than 27,000 casualties. Of some 18,000 Japanese soldiers defending the island, 216 survived. 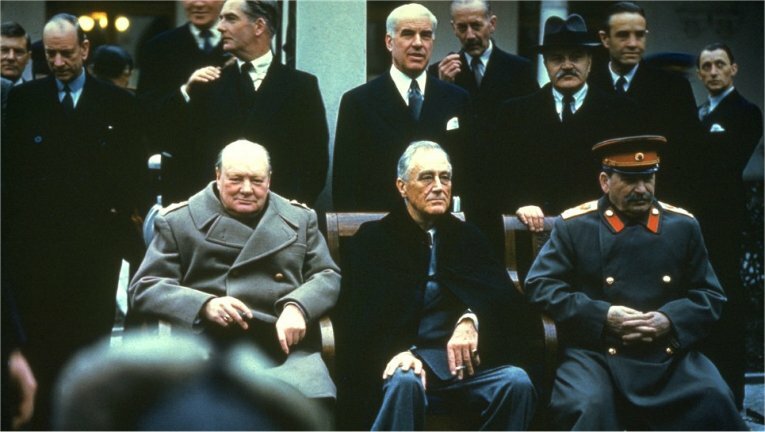 after the crossing of the Rhine River by the U.S. 9th Army on March 26, 1945.
and Russian Premier Joseph Stalin at the Yalta Conference on February 1945. 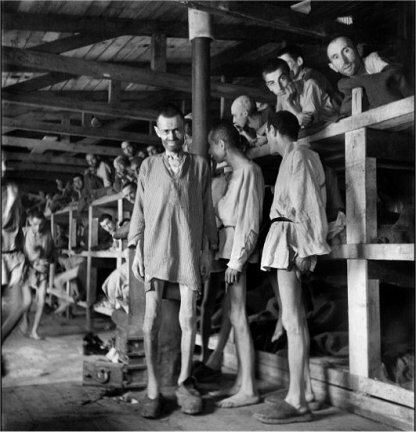 Prisoners line block 61 of Buchenwald concentration camp in April 1945. 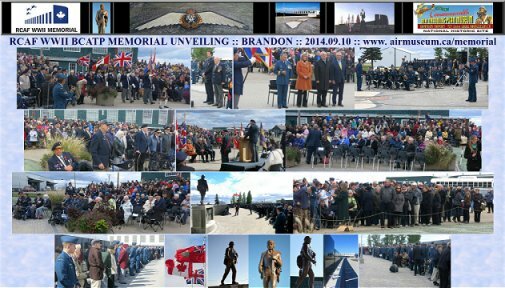 The construction of Buchenwald started July 15, 1937, and the camp was liberated by U.S. Gen. George Patton's troops on April 11, 1945. 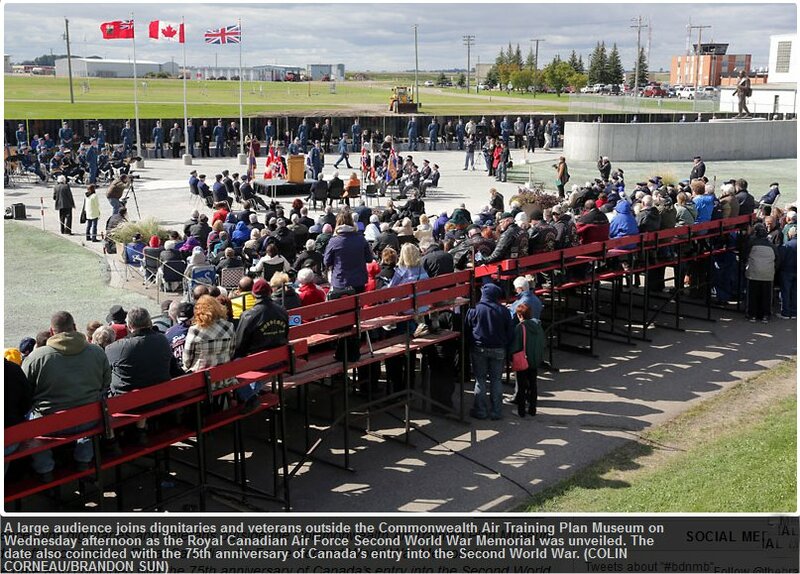 Between 239,000 and 250,000 people were imprisoned in the camp. 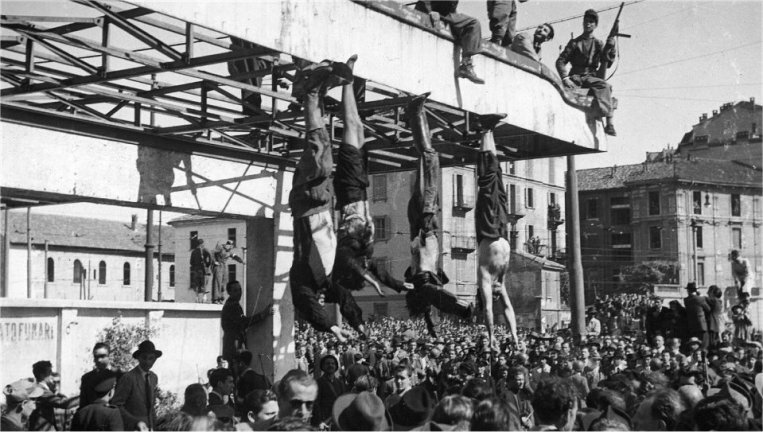 About 56,000 died, including 11,000 Jews. on its way to the White House. 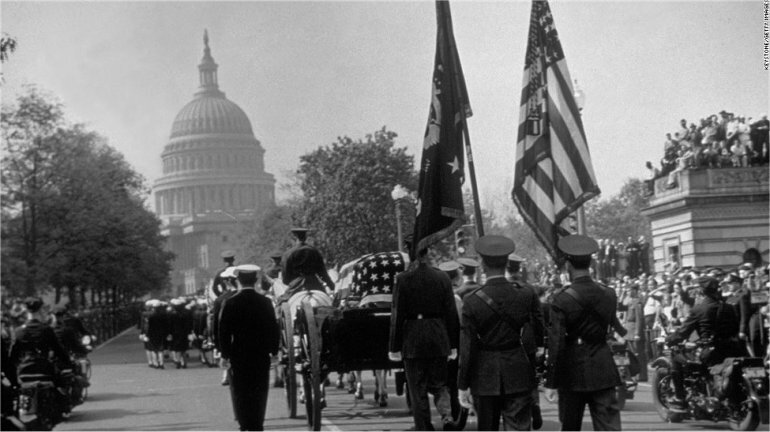 Roosevelt died on April 12, 1945, just weeks before Germany's surrender. 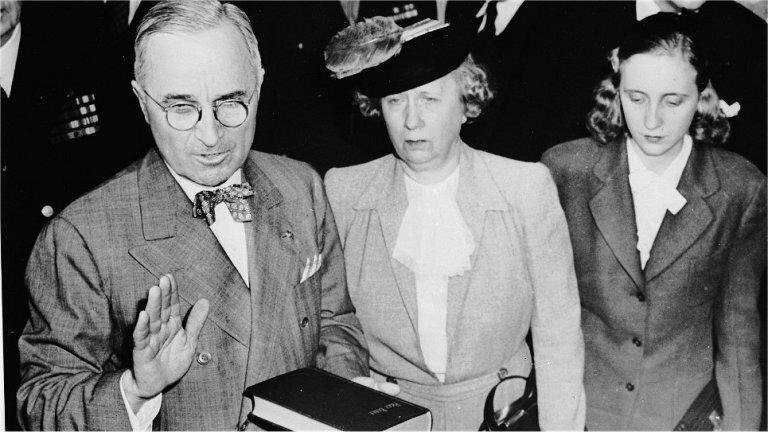 Harry S. Truman takes the oath of office on April 12, 1945, as he becomes the 33rd president of the United States. 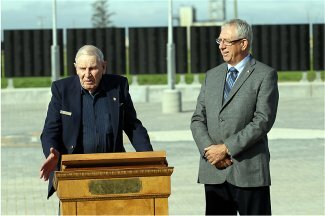 Standing beside him are his wife, Bess, and daughter Margaret. 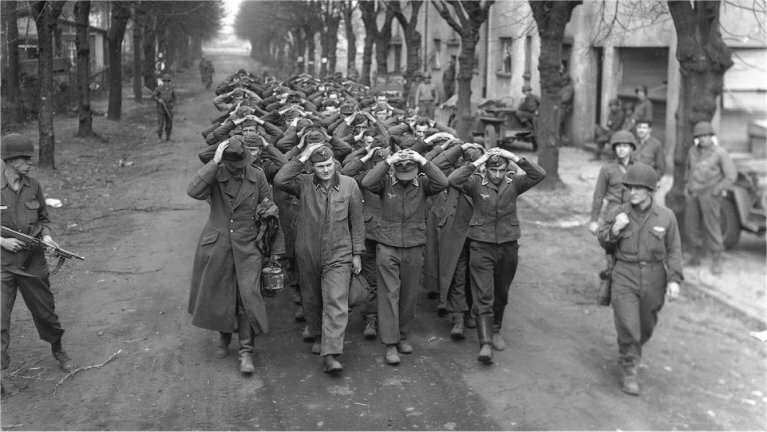 while attempting to escape to Switzerland on April 28, 1945. 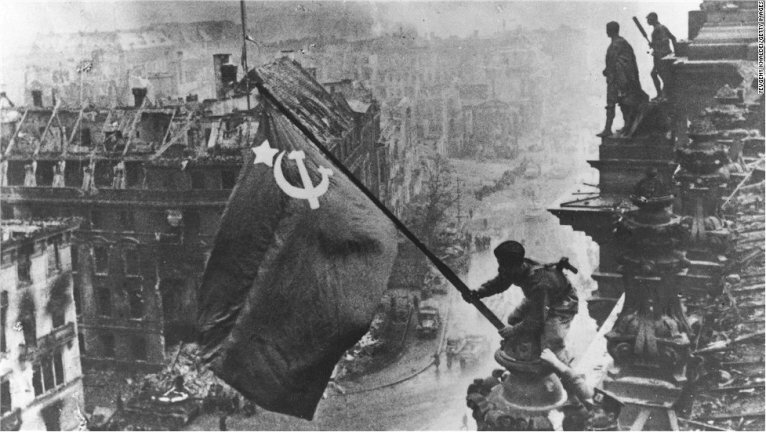 Russian soldiers wave their flag, made from tablecloths, over the ruins of the Reichstag in Berlin on April 30, 1945. That day, as the Soviets were within blocks of his bunker at the Reich Chancellery, Adolf Hitler committed suicide. 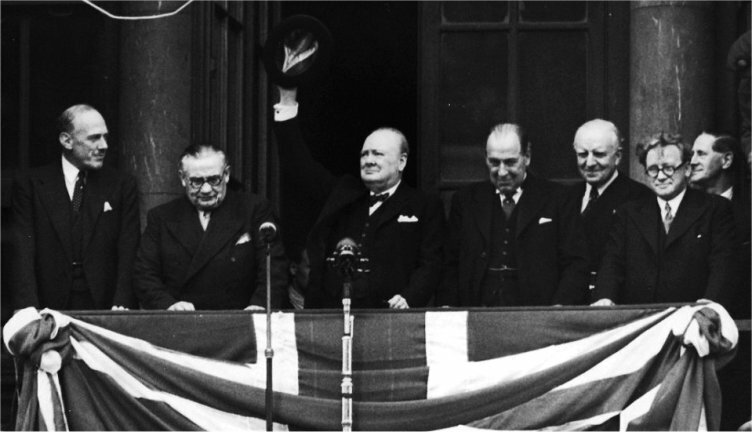 from the balcony of the Ministry of Health in Whitehall, London, on V-E Day, May 8, 1945. The war in Europe is officially over. 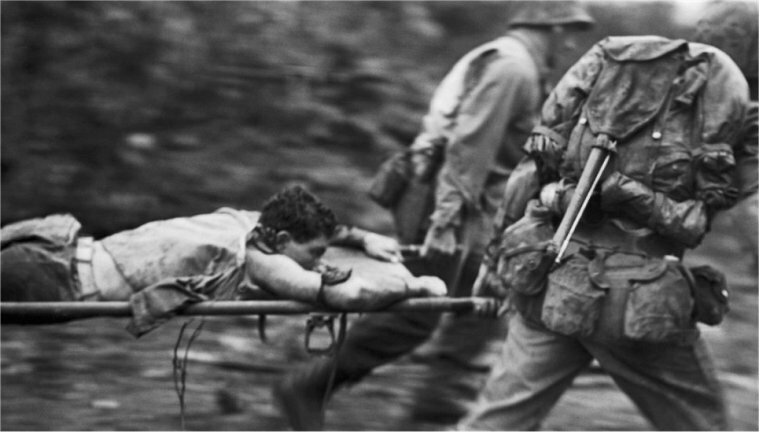 Soldiers rush an injured U.S. Marine from a battlefield in Okinawa Island during the Battle of Okinawa in June 1945.
the first instant of the first atomic bomb test, on July 16, 1945, at 5:29 a.m. at Trinity Site in New Mexico. if it would not surrender unconditionally. 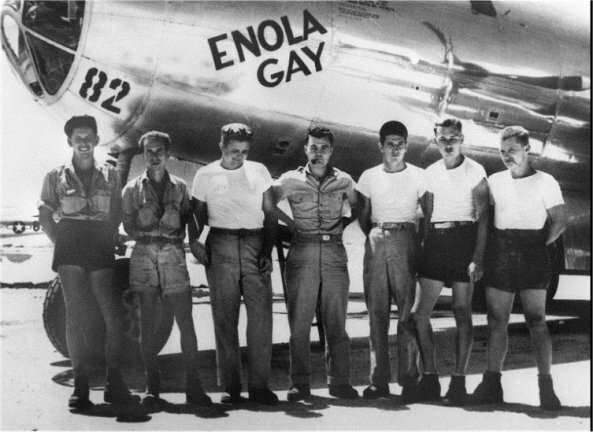 Col. Paul W. Tibbets Jr., center, stands with the ground crew of the B-29 bomber "Enola Gay,"
which Tibbets piloted on August 6, 1945. 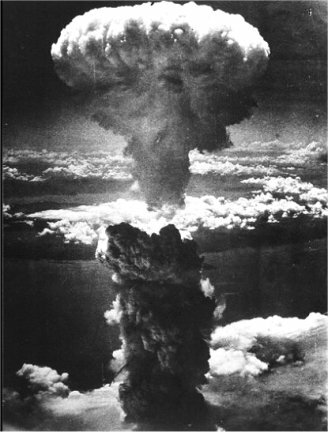 The atomic bomb dropped on Hiroshima, Japan, that day killed 140,000 people. 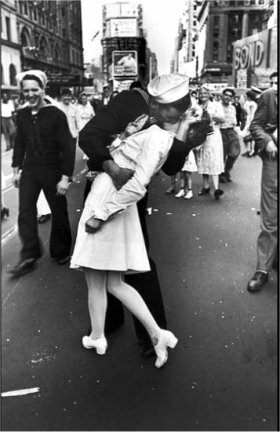 after the atomic bombing of the Japanese city of Hiroshima by the United States. 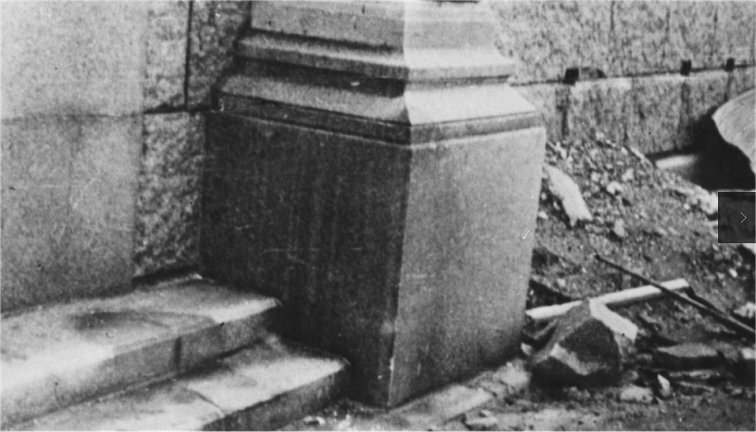 The person had been sitting on the steps when the heat from the explosion burned the surface of the stone around the victim's body. 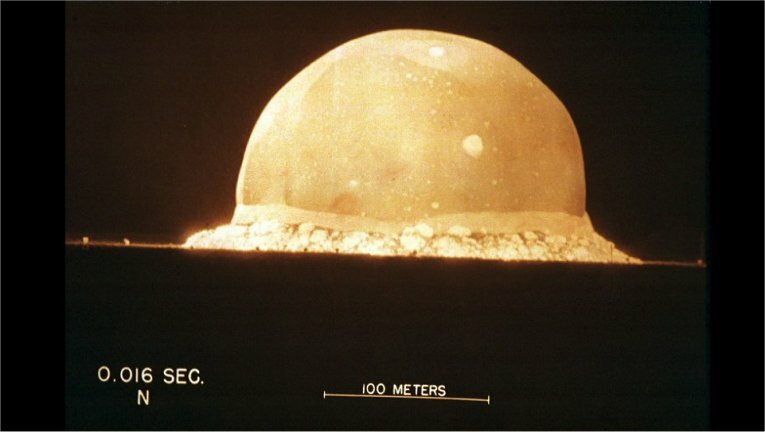 the result of an atomic bomb, the second ever used in warfare, on August 8, 1945. It was dropped from a U.S. Air Force B-29 Superfortress. with thousands of others in New York's Times Square. officially bringing World War II to an end. 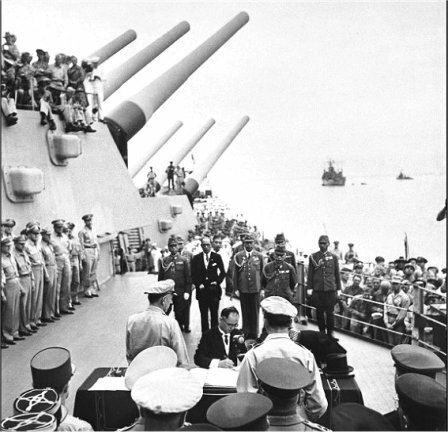 Overseeing the surrender is U.S. Gen. Douglas McArthur (right, back to camera).